One of the cool things about changes in staff line-up is that as you get to know the new people you work with you sometimes find people volunteering unusual and distinctive hobbies. 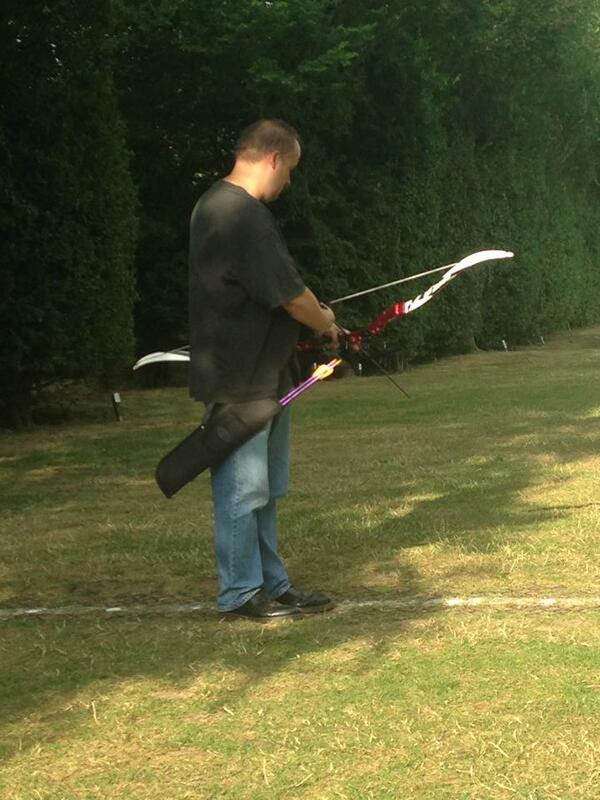 Case in point has been the recent revelation that one of my colleagues is an archer. She in turn has been fascinated by the tales of horseriding that I’ve been telling about my daughter and that our main nickname for her these days is ‘Charleesi’ – loosely inspired as a conflation of her name and that of ‘Khaleesi’ Daenerys Targaryen from Game of Thrones. Jokes have abounded about Charlie learning archery on top of her riding – perhaps summoning images of Attila the Hen, leading her own barbarian hordes to overrun the world in the shadow of dragons (well okay, perhaps our conversations get a little surreal between serving customers). All of which led to wondering whether Charlie actually would be interested. So I asked her. From the way her eyes lit up and a grin appeared I knew this was going to be fun. 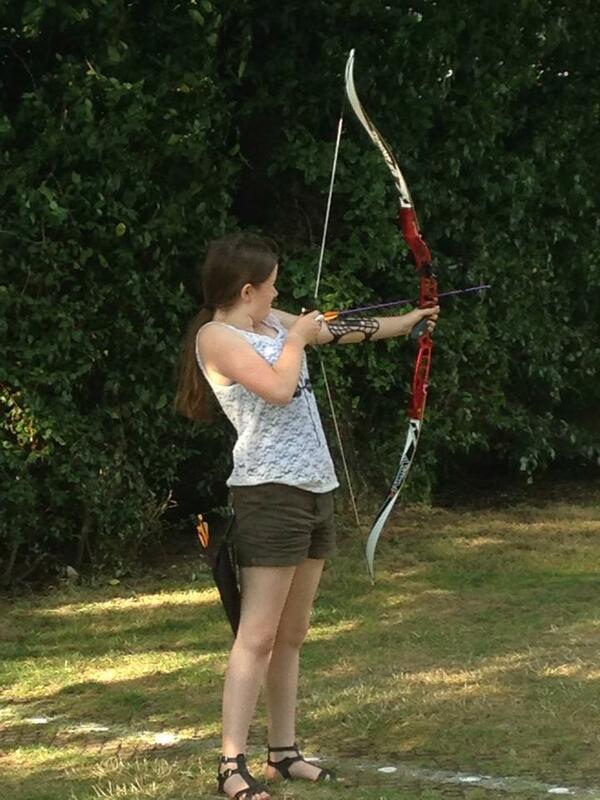 So this weekend we arranged to go to a field out the back of the BP Headquarters in Sunbury with Alice, who is a member of the local archery club. We went through safety and range discipline instruction before watching Alice assemble and string her bow and the lesson began. After her shoot and then walking the range to retrieve the loosed arrows, it was our turn. Alice’s bow is a 24lb draw, and so no one was expecting Charleesi to hit the 40 yard target. Alice believes that if Charlie does take up archery that she would probably start with a 16 to 18 lb draw bow, for example. Nevertheless, she was regularly getting the arrows to fly a good 30-35 yards and more or less in the right direction. Her regular riding experience was definitely showing in her upper body strength and positioning. When it came to my turn – because let’s face it if the opportunity is offered why not take it – I was tending to overshoot the target. It gave me a new-found appreciation for how difficult archery is compared to how it is shown in film and television – or simulated in games like Dungeons and Dragons. There’s certainly something very soothing about archery. I found the rest of the world fading away, narrowing down to my view to the target down the shaft of the arrow. There’s a satisfaction to be found in the thrum of the bowstring on release that as a first timer meant I didn’t even care if I hit the target or not. Perhaps there’s something primal about it – its purely the storing and release of muscle power to propel that arrow far further than you could throw it. Arrows don’t fly straight, which is a little counter-intuitive, but spiral through the air instead, which to my mind makes the sport as much art as science, with just that little bit extra randomness in the process than you might expect from shooting a rifle, for example. And then there’s just the plain satisfaction of it – comparing notes with Charleesi later – we both agreed that there’s something very cool about bow use. Look at archers in films in recent years – Legolas in Lord of the Rings, Hawkeye in the Avengers, Katniss in the Hunger Games – and there’s something indefinablyimpressive about the combination of hand-eye coordination and strength required that absolutely resonates when you’re doing it yourself. The day, sadly, was not without injury. My own, in fact, which just highlights the need for proper protective equipment and awareness when shooting. Don’t worry, I didn’t get shot. 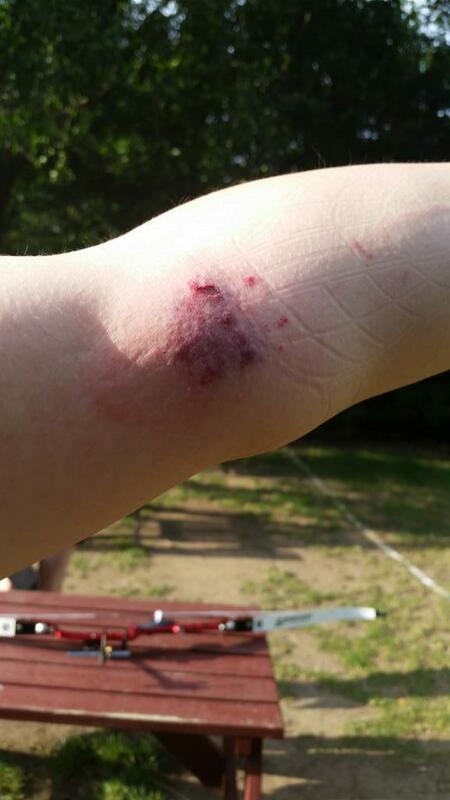 My arms are considerably thicker than Alice and Charleesi’s, and we were using Alice’s forearm guard to protect against the slap of the bowstring when releasing our shots. Towards the end of my last round of shots the velcro fastening slipped enough that the first couple of shots moved the guard down my arm so that the next couple of shots smacked straight into unprotected skin. As you can see in the photo, it easily broke the skin and bruised the surrounding flesh, and writing this about a day later I can testify that that you are certainly very aware of the wound for some time. This entry was posted in family, friends, hobbies, household and tagged archery, family, hobbies, household. Bookmark the permalink.